If you want to go to Oktoberfest in Munich, Germany this fall, book your accommodations now. That's why this post is going up at the beginning of summer rather than closer to Oktoberfest, because, well, if you want to go, you'll need to make sure you have a place to stay (some hotels/hostels even sell out a year in advance). Make sure you do this soon so you don't miss out on it, because Oktoberfest is AWESOME. Six million people attend Oktoberfest in Munich every year. Oktoberfest lasts for 16 days, starting mid-September and finishing the first weekend of October. 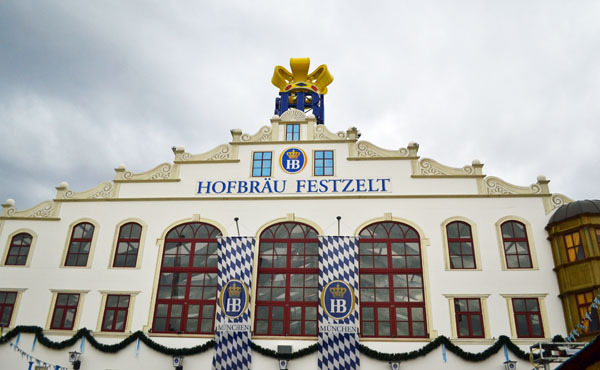 Celebrate and party at the world's largest beer festival with people from around the world. I met people from all over including Brazil, Australia, a bunch of Europeans, and of course, some awesome Germans. The beer is exclusive to the festival and is really, really good. Six Munich breweries brew their own Oktoberfest Beer. I didn't like beer until I went to Oktoberfest. Now I love it, and I have the beer from Hofbrauhaus and Hacker to thank for that. When you order beer, it comes in a stein: a large glass with a handle that holds 1 liter (34 ounces) and the beer must be a minimum of 6%. The food. Giant soft pretzels, sausage, pork knuckle, schnitzel, and sauerkraut are just a few of the traditional German foods you'll find at Oktoberfest. They all pair really well with beer. People dress up in lederhosen and dirndls. And not just a few randos - you'll look more out of place in regular clothes than you will in lederhosen (guys) or a dirndl (girls). Pretty much everyone is dressed up in the traditional German outfits which only adds to the festive feel of Oktoberfest. You can find authentic, good quality lederhosen and dirndls at plenty of stores around Munich before you head to the tents. Fun, lively atmosphere. Everyone is jolly and having a grand ol' time inside the tents. A lively atmosphere calls for great memories, possibly with new friends that you meet in the tents. It's also a CARNIVAL. There's a reason they say it's like Disneyland for adults. How much more fun can it get when Oktoberfest also doubles as a carnival?! Outside the tents you'll find plenty of games and amusement park rides. The one that that goes up really high and does a big drop gives you a great aerial view of the festival grounds. Book a place to stay, ASAP! Oktoberfest season in Munich sees a heavy amount of visitors from all over Germany and the rest of the world. The earlier you book your place to stay, the better - as availability for hotels, hostels, Airbnbs, and Couchsurfing can go fast.